House (1986)/House 2 (1987) | Who Killed Orrin Grey? 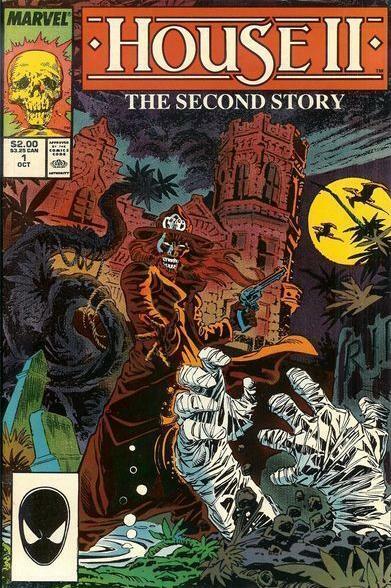 Marvel comics released a comic book adaptation of House 2 the same year that the movie came out. Honestly, it probably worked better in that format. My new favorite thing is listening to commentary tracks while I cook or wash dishes. It requires the exact right amount of my attention, and I can kind of see the TV from the kitchen, so I can look up occasionally to get my bearings. Recently, I was listening to the commentary track on Night of the Creeps, one of those movies that seems to get better every time I watch it, and was reminded that writer/director Fred Dekker’s first screen credit was as a writer on House (not to be confused with House or House), released earlier the same year as Creeps. I vaguely recalled seeing either House or its sequel or both back when I was a kid, and as they were both available on Netflix, I figured I’d give them another look. More the fool I. House, from a story by Dekker and directed by genre veteran Steve Miner (most notably for me, director of my beloved Lake Placid), is basically insufferable. A lot of people (myself included, it turns out) harbored some fond memories of it from their youth, and lord knows it’s got moments of what almost feel like promise, but the whole thing is really just a mess. This in spite of a bunch of monsters (including one wearing a dress and lipstick like something from a Bugs Bunny cartoon) and a zombified Vietnam soldier played by the big bald guy from Night Court. The plot itself is almost exactly like an extended Tales from the Crypt episode, and it has moments that almost genuinely work, either dramatically or as a B-grade horror film, but it is also full of non-logic, and moments that veer into zany comedy that falls completely flat. It’s the kind of movie that’s better when you turn on the TV and catch just part of it and go, “WTF did I just see?” than when you actually try to sit through the whole thing. Yeah, this is pretty much what House 2 is like. Which doesn’t bode well for House 2, written and directed by the same gentleman credited with the actual screenplay of House, who went on to direct a late-game Children of the Corn sequel and this bizarre-sounding thing about an elf superhero starring Jeffrey Combs, which I may have to watch someday because I hate myself. Fortunately, while House 2 isn’t a better movie than the first one, it is more consistent. It doesn’t have any illusions that it’s a horror movie, for example, nor even a Tales from the Crypt episode. Instead, it’s like a live-action pilot for a Saturday morning cartoon show, in which a couple of wacky friends (one of them played by the guy who plays Perlmutter in Castle) discover that their house is full of doors that let onto various other time periods. Supporting characters include a mummified grandpa, a mischievous baby pterodactyl, and some kind of thing that’s like a cross between a dog and a caterpillar (dogerpillar?). I’m not even kidding. 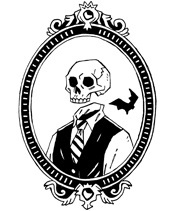 And the villain is a zombified guy again, this time a gunslinger. 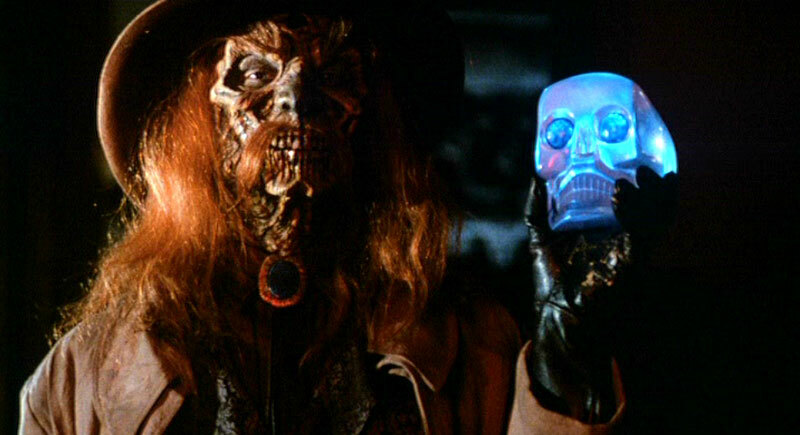 And the whole thing revolves around a MacGuffin in the form of a crystal skull. It sounds like fun, and it occasionally is, but mostly it’s more fun to describe than it was to watch. Both movies are sort of great in tiny spurts, and occasionally just jaw-dropping in their complete batshit insanity, but unfortunately neither of them are particularly great to sit through. 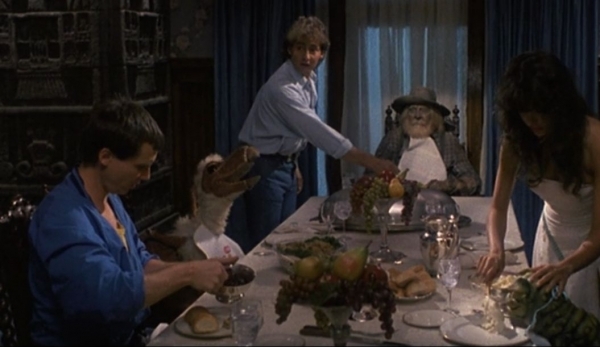 If you absolutely must check one of them out, I recommend skipping straight to House 2, which has no real relationship to the first movie, and at least has dinosaurs and crystal skulls and such to get you by.